FC Goa were rampant against Mumbai City FC in their Hero Indian Super League encounter on Tuesday night at the Jawaharlal Nehru Stadium in Fatorda. Thongkhosiem Haokip and Dudu both scored hat-tricks while Reinaldo scored a late goal in a 7-0 rout of Mumbai in front of 18,573 spectators. The visitors were finding it difficult to deal with Raju Gaekwad’s long throw-ins into the box during the opening stages. 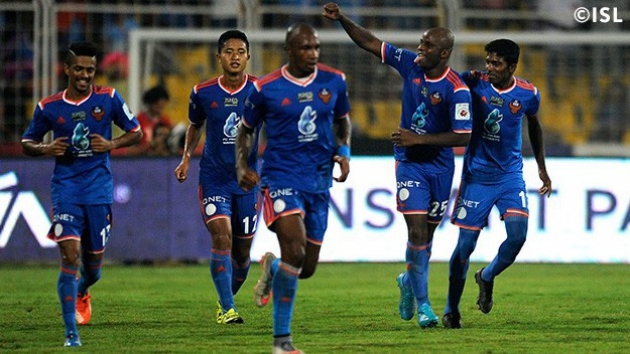 Mumbai keeper Subrata Paul was called into action in the 10th minute when a Joffre free-kick forced him into a save. Mumbai’s first big chance of the game came 10 minutes later when a neat ball into space sent Sunil Chhetri clear on the right. He failed to capitalise on the opportunity though after cutting in on his left before pulling the trigger.